Those of you who came to hear Alice Oswald at the Woodstock poetry festival might enjoy seeing a little clip of her reciting the final section here, and also a fascinating interview with David Morley (who read the following day), when she was given the Warwick Prize. She talks about bringing a poem to life - 'the god passes through the room when you get a poem alive...when you hear it in a room something quite supernatural happens' -which is perhaps the best description of what did happen when she gave us Memorial. 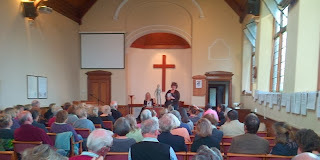 First, a huge thank you to everyone, poets and audience, who made the second festival go so well. We are planning the third. We were so grateful that Pam Ayres came to open the festival. The church was full, and she performed brilliantly - her timing was spot-on, her rapport with the audience immediate and excellent. What I love about her work is that she brings poetry to so many people who would normally run a mile at the word 'poetry'. She is witty and acute and warm. She is also a very kind supporter of independent bookshops and festivals. The rest of the evening was like a local, community version of Pam Ayres - A Funny Way With Words drew in large numbers of people from Charlbury - the book was written and produced there, published by Jon Carpenter. And Kathy Clugston held everything together in the best possible BBC style. Peter McDonald and Patrick McGuinness in the bookshop gave a totally different reading of their work to a very good audience (including three small boys, one of whom quizzed Patrick McGuinness on his use of a poetic alter-ego), I was very sad to miss the readings by MsCellaneous as I had to collect someone from the station - I heard it went very well and we all ate the cakes all weekend! I wanted to say a huge thank you for bringing Alice to the festival. It was a magical experience and one that will stay with me always. recite so much by heart, and by the beauty of her words and poetry. Loved it and won't forget it. The New Libertines finished off the evening in style - if you didn't come this year, do try and catch them next year. The term 'performance poetry' might frighten potential audiences into thinking they are going to be faced with alien and terrifyingly trendy stuff, which isn't the case. Not that they aren't trendy, of course, but they are very good poets who are also good at performing their work and, like Pam Ayres, engaging with the audience. David Morley read on his own on Sunday as Liz Berry couldn't be with us. He talked about John Clare and about Romani language and culture and read from his new book. For a detailed account of David Constantine, Sasha Dugdale and Olivia McCannon, see here. And at the end we went into the Woodstock Arms where Jenny Lewis had organised a pub full of people and sixteen readers - the fire was going, people were drinking and chatting, it was the best possible way of ending the festival. Thursday November 14, 5.30pm, St Mary Magdakene Church, £10. Pam Ayres will be reading from her latest poetry collection, You Made Me Late Again! Pam's poems are observant, witty and poignant in equal measure - her subjects are the everyday and the universal. Most of the poems in You Made Me Late Again! are brand new, and it also features several favourites from her stage shows, published here for the first time, such as 'The Make-Up Lady' and 'Tippy Tappy Feet'. Pam Ayres has been a writer, broadcaster and entertainer for nearly forty eyars since winning the talent show Opportunity Knocks in 1975, and she has become an audience favourite for her sharp perception of the comic detail of everyday life. She is the author of several bestselling poetry collections and a memoir, The Necessary Aptitude. Pam and her husband have lived in Gloucestershire for over twenty-fice years, where they have a smallholding with cattle, sheep, bees, chickens and guinea fowl. She was awarded the MBE in 2004. Peter McDonald is a poet and critic - he lives in Woodstock and teaches at Christ Church, Oxford, where he is Christopher Tower Student and Tutor in Poetry. His Collected Poems was published by Carcanet in 2012. He is currently editing the poetry of WB Yeats. Saturday 16 November, 3pm, £5 to include tea and cakes. MsCellaneous are an Oxford-based group of eight women who have been meeting and writing poetry together for nine years. One of their works is currently on display in the Oxfordshire Museum in Woodstock - a renga written jointly after a visit to the museum and inspired by some of the exhibits. Saturday November 16, 4.30pm, tickets £5. Alice Oswald is the winner of this year's Warwick Prize, the first time a poet has won the prize. She will be reciting Memorial, her reworking of Homer's Iliad, This is a magnificent and mesmerising performance, all the more remarkable for being recited from memory. 'Oswald has achieved a miraculous feat. She's exposed a skeleton, but found something magnificently eerie and rich. She has truly made, to borrow a phrase from Stephen Spender, a "miniature Iliad", taut, fluid and graceful, its tones knelling like bells into the clear air, ringing out in remembrance of all the untimely dead' Telegraph. Saturday 16 November, 8.30pm, £5. This very lively group of performance poets also appeared at last year's festival. The line-upfor 2013 has some of the same people - it's introduced, as before, by the irrepressible Dan Holloway, who has been MC of The New Libertines since 2011. Dan was the winner of this summer's Notes poetry competition as well as the HarperCollins First Lines prize. Lucy Ayrton is the author of Lullabies to Make Your Children Cry, published by Stewed Rhubarb Press, a wonderful feminist reimagining of traditional fairytales based on her hugely successful show of the same name, which has received rave reviews at the Edinburgh Fringe for the past two years. Kiran Millwood Hargrave is President of Oxford University Poetry Society. She is a former poet-in-residence at the Scott Polar Research Institute, and one of the 2013 Barbican Young Poets, and author of Splitfish, released in September by Gatehouse Press. Tina Sederholm is a member of the current UK National Team Poetry Slam Champions. She has performed her show Evie and the Perfect Cupcake to rapturous reviews across the UK at venues from the Edinburgh Fringe to Chipping Norton Literary festival. She has just published her first collection, The Velvet Box. Claire Trevien is co-hose of Penning Perfumes, which received an Arts Council grant for its second UK tour celebrating the blending of poetry and scent. Claire is also editor-in-chief of Sabotage Reviews, the UK's leading review site for poetry pamphlets. Her debut collection The Shipwrecked House (Penned in the Margins) is the only poetry book longlisted for the 2013 Guardian First Book Award. Sunday November 17, 4pm, Woodstock Methodist Church, £5. David Morley is Professor of Writing and Director of the Warwick Writing Programme at the University of Warwick. His most recent poetry collection is The Gipsy and the Poet, a Poetry Book Society Recommendation, published by Carcanet in August and inspired by a real-life encounter between the poet John Clare and a gipsy called Wisdom Smith. David was one of the judges of the 2012 TS Eliot Prize and is judging the 2013 Foyle Young Poets of the Year. He has read before in Woodstock, at The Woodstock Arms, and we are delighted to welcome him back. Liz Berry was born in the Black Country. She received an Eric Gregory Award in 2009 and won the 2012 Poetry London competition. She is assistant poetry editor for Ambit magazine and tell-lighthouse published her pamphlet The Patron Saint of Schoolgirls in 2010. Her debut collection is being published by Chatto & Windus next year: '...a compelling new voice - one that will continue to grow in range and authority' - Andrew Motion. Reading together on Sunday 17 November at 6.30pm in Woodstock Methodist Church - tickets must be booked in advance through The Woodstock Bookshop and cost £5 each - or buy any of their books from us and have free entry. David Constantine has published ten books of poetry, two short story collections, a novel and several translations including Goethe's Faust for Penguin Classics. His most recent poetry collection is Nine Fathom Deep. He was co-editor of Modern Poetry in Translation from 2004-2013. This year his collection of short stories, Tea at the Midland and Other Stories, won the Frank O'Connor International Short Story Award - he is the first English writer to win the award. He is a fellow of the Queen's College, Oxford. Sasha Dugdale has taken over from David Constantine as editor of Modern Poetry in Translation. She has been a translator and consultant for the Royal Court Theatre and other theatre companies - Plasticine, her translation of Vassily Sigarev, won the Evening Standard Award for Most Promising Playwright. She has published two collections of Russian poetry and three collections of her own poems - most recently Red House. Olivia McCannon's first collection, Exactly My Own Length, was shortlisted for the Seamus Heaney Centre prize and won the 2012 Fenton Aldeburgh First Collection Prize. This is an open evening on Sunday 17 November at 8.30pm in The Woodstock Arms for local poets and is free entry to all - both poets and audience. It is the final event in this year's Woodstock Poetry Festival and should be a lovely way to round off the weekend. Jenny Lewis is a poet, playwright, children’s author and songwriter who specializes in cross disciplinary work combining poetry with other art forms. She first trained as a painter at the Ruskin School of Art before reading English at St Edmund Hall, Oxford. She has published two books of poetry (When I Became an Amazon, Iron Press 1996 and Fathom, Oxford Poets/ Carcanet 2007) and has had several plays and poetry cycles performed at theatres across the UK including her verse drama, After Gilgamesh (for Pegasus Theatre, Oxford) published by Mulfran Press, 2011. She teaches poetry at Oxford University and her next collection, Taking Mesopotamia, is forthcoming from Oxford Poets/ Carcanet. Jenny also runs poetry workshops and various collaborative projects. 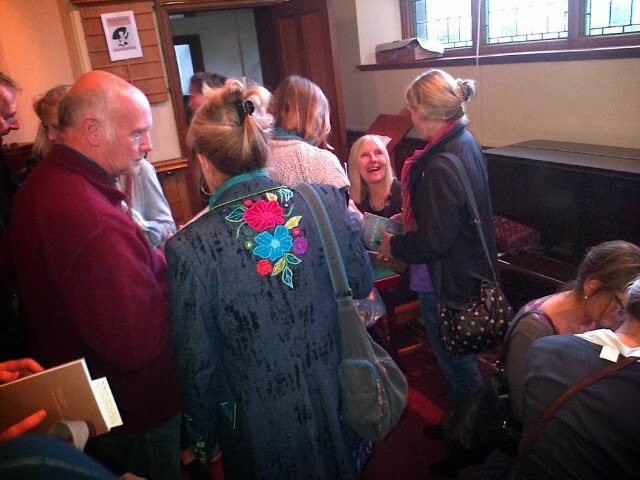 Helen Dunmore (above, signing copies of her books and of Strings of Pearls) launched Strings of Pearls in great style at Woodstock Methodist Church on Thursday. She spoke so well about jewellery - the way it links parents and children, lovers, the past and the present - and read poems from her own latest collection, too, The Malarkey. She will be speaking at Woodstock Methodist Church on Monday 18 November at 7pm - tickets £5, which will be deducted off the book if you buy a copy. We have already taken a lot of bookings for this talk so you need to book early! We have now finalised the programme for the 2013 festival and are taking bookings. We are so grateful to all the poets for taking part - it is an eclectic and wonderful mix of poetry. Jilted City is his second collection. MsCellaneous, 3pm. 8 assorted poets from an Oxford-based poetry group. Prize and is judging the 2013 Foyle Young Poets of the Year. He is Professor of Writing and Director of the Warwick Writing Programme at the University of Warwick. David Constantine won the Frank O’Connor International Short Story Award in 2013 for his collection, Tea at the Midland. He is a Fellow of the Queen’s College, Oxford, and was co-editor of Modern Poetry in Translation from 2004 to 2013. His most recent volume of poetry is Nine Fathom Deep. who has published two collections of translations of Russian poetry and three collections of her own poetry (with Carcanet).